I'm just chatting to Denise Elliott, who was a colleague and excellent assistant when we were both in Biotech and before we escaped into running our own businesses. Denise is running an ethical fashion business called Samamba based in Cambridge. She is active at most of the major festivals and of course, with Christmas coming up, will be at the Christmas Markets, for example Netherhall Shopping Nights on Friday the 18th and Bury St Edmunds on the 25th - 27th November. Denise began Samamba with handmade jewellery, using natural materials such as semi precious stones, freshwater pearls, mother of pearl, glass, seeds and wood, for example. This is still is the mainstay of her business. Clothes and accessories then also entered her portfolio. However, the amazing new item is Hula Hoops - which she makes tailor-made for customers. 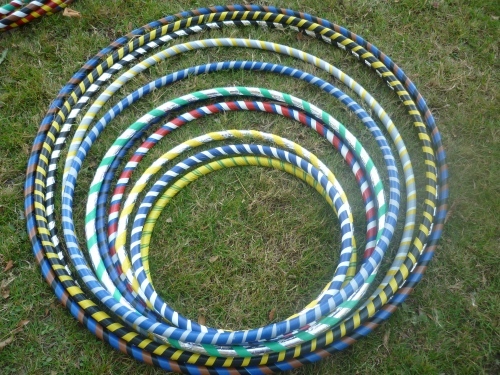 So whether you are a petite child or have a fun maturer figure - Denise can make a hula hoop for you. Apparently, it is not only great exercise - but warms you up. Hula Hoops have been a real hit for Denise at the festivals wherever she gives workshops. Samamba's new product line in development is the use natural plant dyes for fabrics which she hopes to bring to the market fir the 2012 season. Currently Denise sources her own fabrics and she is now eager to find sources of fully organic cotton. This may mean helping a local farmer in Thailand or Turkey to convert their crops to organic methods. Apart from catching up, our talk turned to vital business items such as best ways to improve your online presence. I recently modernised my website and Denise is eager to do the same. When we started, it was all basic HTML coding - now there are excellent content management systems that make it much easier to have a professional looking website which can be updated more easily. Blogs are also an excellent communication tool and social media such as Twitter and very importantly for business to client companies, Facebook. If you are interested in ethical fashion accessories from Samamba, have a look at Denise Elliott's site http://www.samamba.co.uk/. Put it in your favourites and check out the new site as it is developed over the coming months.